A massive congratulations goes to our Sailfish member Oliver Ralph who took part representing Burwain SC at the RYA Zone Championships at Yorkshire Dales SC on Saturday 28th September. 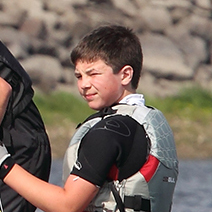 Oliver (aged 14) is a relatively new member of the Burwain SC for just over a year and took 1st place in all three places helming a club Topper against a large field. This success is clearly down to Oliver’s love of sailing, dedication and his thirst for knowledge for different sailing experiences. As well as being an active member of Burwain’s Sailfish Club he has gained considerable experience this year crewing for members in their GP14’s, in particular crewing regularly for Lee Tenant where he has been able to pick up a lot of sailing knowledge and no doubt some of the ‘dark arts’ of sailing which has no doubt helped him in his racing.